After all the hype about this book, and being a vegetarian myself, how could I resist the chance to read this crazily incredible book? The book was originally published in Korean as three short stories, which are brought together here to tell the tale of Yeong-hye, a young Korean woman who becomes a vegetarian after a violent and disturbing dream. We never hear from Yeong-hye herself, instead her story is told by her husband (who married her solely because she was unremarkable and passive), her brother-in-law (who harbors deeply hidden appetites of his own), and finally her sister (wrestling with her own guilt and repression). The story spirals out of control as Yeong-hye, trying to male a unilateral decision in a patriarchal and conservative society, is pushed past the breaking point. 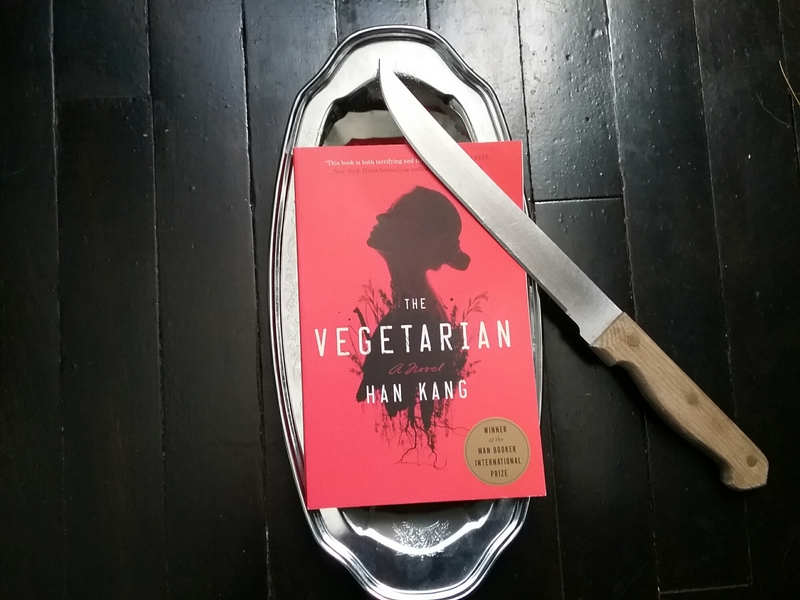 The violence of her husband and family to Yeong-hye’s vegetarianism, and the violence of her response is arresting and disturbing at the same time. As the book continues on, one is forced to wonder if Yeong-hye’s descent into madness is a result of her vegetarianism , or society’s reaction to her choice. This book is strange and beautifully written, but certainly hard to read in places. There is a lot to to this book, a lot of layers, and I am still parsing through my impressions of it. Overall, however, I think this book is a fascinating read, and well worth your time. I would recommend it to anyone looking for something unique and off the beaten path. A free copy of this book was provided by the publisher via Blogging for Books in exchange for an honest review. The Vegetarian is currently available for purchase.